This week, as promised, we are posting the conclusion of “Turn of Events”, the story of 2 Shea Charter’s adventure on a Southport in a fast moving and fierce Gulf of Mexico storm. The USCG Seaman hopped back in then chucked every dive tank overboard. Free from the weight of tanks and water pouring out the transom openings, she was back to having 3 inches of water on the deck in just minutes. The USCG refused to leave me onboard, so before leaving my boat I untied from the tow, dropped two anchors, hoisted up a dive flag then prayed she would still be there the next day, gear and all. By the time we were safe on land, eight hours had passed from the time of the distress call, which put us at the dock just after 4:00 am. The next morning, and after our nerves calmed down, myself, RC Pinson and Dan Jolitz (divers on the trip) boarded their boat and headed to where I had left the 2 Shea. My stomach in knots, I assumed the worst and that my investment was lost at sea. I was completely overwhelmed to see her, along with our gear, anchored where we left her just hours before. She fired right up once we added fuel to her tank and I was thrilled to drive her to the dock to fillet all the fish, which were still ice cold in the fish boxes. A few of us headed back out a few days later in an attempt to find the 32 dive tanks but our luck had run out. We did however discover three new fishing spots in our search, aptly named Lost Tanks, Lost Tanks 2, and CG (Coast Guard) Night. Through these trials, the other 2 Shea losses were electrical – the forward anchor switch and two under gunnel speakers- and ego. We missed the weigh in having some of the biggest fish landed in the tournament! I am convinced by being a Southport, the 2 Shea avoided becoming another set of numbers along the bottom of the Gulf of Mexico. She proved her worth tenfold, coming off a night where 32 dive tanks were donated to the sea from her bow, her deck was covered by at least six inches of water for the better part of seven hours (waist deep more than once), her entire starboard side submerged and slammed twice by a 47 foot Coast Guard vessel. I voluntarily put “one of the best constructed boats my salesman had ever seen in 30 years selling boats” through a tougher test than the designers had in mind. Fast forward five years, 4,500 hard hours on the two original Yamaha 250 engines, the 2 Shea is still a vital piece of my charter fleet. She’s kept up with the demands of 200 days a year hosting charters and for that, I am grateful, though her 33′ sister has caught my eye. 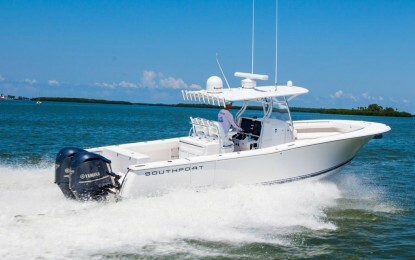 2 Shea charters now runs 2 Southports- the original 2 Shea Southport 28, and recently added a 2015 33 FE, fully loaded with Raymarine electronics and satellite TV. TJ is now a lifelong Southport believer- never turning down an opportunity to tell his story and explain why Southport was the only choice when he was ready to get a bigger boat. For more information on 2 Shea Charters, visit fishanddivetampa.com/. You have always extolled the virtues of the Southport on every trip. It’s easy to see why your family, friends and customers trust you and the equipment. Wow, I’m am glad you posted part two of this exciting story, the Captian, and his tough SouthPort boat.